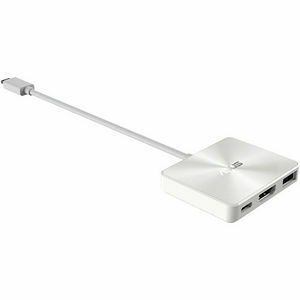 ASUS Mini Dock is a tiny, lightweight and handy expansion dock. It connects to your device via its USB-C port to give you extra ports for connecting peripherals. ASUS Mini Dock is your perfect on-the-go companion! ASUS Mini Dock features an incredibly versatile USB-C connection. You can charge external devices quickly and conveniently via the USB-C port, connect a display to HDMI port for 4K UHD video playback, and use the USB 3.0 port for peripherals such as mice - all at the same time!